If you can't play online, two-player, split-screen mode is a great alternative. The 4-player split-screen mode is a great feature to have if you are having some buddies come over, and is a great feature if you dont play your games online. Speaking of online gameplay...this is where the game is meant to be played. Outtrigger is centered around playing the game online, as you train yourself offline, to then later battle terrorists online. Outtrigger supports both the 56k modem, and Broadband Adapter (except for PPPoE connections found on ADSL), so investors of the Broadband Adapter will be pleased to have another game added to the short list of Broadband Adapter supported games. So overall the gameplay is a great. It is fun to play, but in order to get the full potentional from Outtrigger you will need to get your Dreamcast online (if you haven't already). All this good, now its time to look at the bad, as all games have their downfalls. The controls do take awhile to get used to. Using the standard controller (default controls), it took me awhile to get the handle on the controls. As stated before, the game can definitely be played with the controller, it's just going to take a little practice. If you want to get the best controls from Outtrigger you will have to shell out some extra cash for the Dreamcast keyboard and mouse. But if you own them both, already you are ready to go. The offline, single-player mode can get old really quick. After finishing all the exercises from the Arcade Mode, and then completing the Mission mode unlocking all the hidden levels, characters, and weapons, there is nothing left to do in the single-player game. Deathmatching with bots can be entertaining, but those who've played first-person shooters in the past know that there is nothing better than sparring with another real human being. In Phantasy Star Online you could build up your character levels in the offline mode, which gave meaning to the play mode. But in Outtrigger that is not the case. So if you already can beat the pants off the bots, you won't be learning anything new in single-player mode. It would have been great to see something added to the single-player mode similar to PSO (like character build-ups,etc). Again attacking the offline mode, I found that it wasn't that challenging at all. I completed the single player portion of the game in one day and only found a challenge in a few of the missions. The boss in the last Mission Mode stage was the only real challenge in the game. The game's focus is mainly on the online portion of the game, so it does explain why the challenge wasn't there, but at least Sega could have made it a little more interesting. My main problem with Outtrigger is the single player portion to the game, as the multiplayer and online aspects are awesome. There really isn't a story that is presented during the game. In order to find out the background of the game, I had to read through the manual (bah who reads them :P ) to get the storyline. The intro movie doesn't explain what is going on, and only introduces the main characters from the game, and gives their height/weight,etc. I know that this is an online game, but I would have liked to see a presentation of the story/background of whats going on in the game. Outtrigger is an action oriented game, and not a story driven game. Is this good or bad? Personally I prefer a story driven game, but its a matter of preference here. You decide which you like best. If you like Quake 3 Arena or Unreal Tournament, neither of which are driven by storylines, you will love Outtrigger. 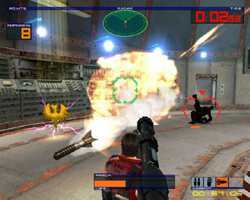 Outtrigger is a great addition to the 3D shooter genre on the Dreamcast. The game has both 1st and 3rd person perspectives, addding a new look to the genre (nice to have a little change). The game features full online play for upto 6-players, and support for the 56k and Broadband Adapter. For offline multiplayer, upto 4 players can play split-screen and it works great. The graphics are supurb,and the textures add great detail to characters and levels. 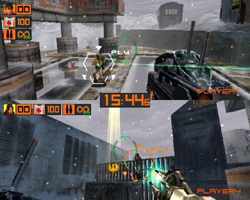 The gameplay is fast and runs at a 60 fps framerate, which is a must for 3D shooting games. Outtrigger is a great multiplayer game, both online and offline. If you are looking for a great single player experience, you will have look elsewhere. (Soldier of Fortune was just released - stay tuned for the review) Overall, I enjoyed Outtrigger. Lots of hidden stuff to unlock, new levels, characters, and weapons. It is a fun, fast paced game, that is packed full of features and great online gameplay. Highs: Great graphics, support for many peripherals including the BBA, Online play! Lows: Offline mode gets old fast, little challenge, not enough story elements.